NVIDIA India kicked off with a latest series, FPS Battles which featured two top Indian teams battling it out for the pride where Team Brutality beat Team Scorchers with a 2-0 (16-2 in de_overpass and 16-10 on de_mirage) strong board in a best-of-three match-up. We witnessed an amazing series of maps between India’s top two CS:GO teams with outcome of Team Brutality coming out on top of the best-of-three arrangement. Significantly, this was one of the unique battles which was supported and organized by NVIDIA India with SoStronk servers adding up the cheese. The match was casted by the CS:GO community veteran Bleh, joined in by casual streamer Captain Arya. Team Brutality was playing with, V3nom, RiX, Ad1, fox and Excali as a stand-in. And on the other side, Scorchers had their full lineup after they recently got a new player, the lineup, Ace, Manan, MithilF, PokerF and Ribbiz. The first map, de_overpass was started well off with Brutals taking the pistol and the following rounds with ease having no players dead on anti ecos and were comfortably able to grab another couple of rounds, the scorelines headed towards 4-0. Shockingly though, PokerF pulled of a massive play with a P250 taking down three Brutal riflers back-to-back which helped Scorchers gain their first round on the board. They couldn’t follow it up and Brutality were able to eventually come back stronger in the sixth round. MithilF’s strong presence on B site charmed some stars but only to make it look darker when V3nom replied back with two quick kills taking the round back under control before stronking a 6-1 comfortable lead. With a followup beautiful 1v2 clutch by Excali which even steered the scoreboard 7-1. Ace however, after lots of hard-work and made convincing attempts to carry his team, was unfortunate to do so even with him going massive on certain rounds. The score on the first half ended up with Scorchers winning only two rounds which were the only rounds they won in the whole map and Brutality clinched the victory comfortably with a 16-2 scoreline led by the stand-in Excali who showed us some quality CS:GO shots! The second map started with a different tone with Scorchers getting off the mark very first round with additional followups but only later denied by Excali once again who took a massive triple kill in an eco rounds, the first round for Brutality. They won the second and the following round which destroyed Scorchers economy, forcing them to eco on the fifth round with scores tied 2-2. There was no looking back for Brutals henceforth a 7-2 strong lead before the first phase. The first half concluded on a regular 9 round lead for the counter terrorists, with Scorchers hoping to win the pistol to bring it back from 6-9 in their favor. The second half of the game was even more reluctant on Scorchers part as they were being completely denied by Brutals, V3nom took the charge for the map only to rip off the opponents in a fashionable way, leading duals, clutches triples and quad kills, V3nom made his presence felt in the second map, steered his team to success on the second map with 16-10 and in a much stronger way. Overall, Nvidia India FPS Battles did turn out to be successful with 200+ concurrent viewers on the stream and over thousands of impressions and interactions. Scorchers had all the support from the CSGO fans in India, unfortunately they couldn’t please the base. It seemed quiet a few times that they had communication problems, however their individual performances did impress the audiences as they had an exciting Friday evening experience from the likes of Ace and PokerF, and were done for today. 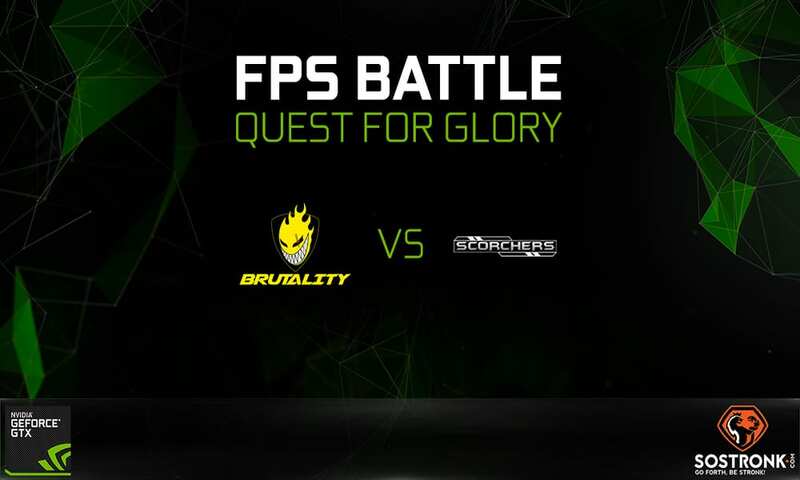 Brutality all-together came-up as a team even though with 2 stand-ins to win the first ever Nvidia India FPS Battle series comfortably with 2-0 figures, declining the need of a third map whatsoever. And Bleh, who deploys eargasm to the viewers! We thank Nvidia India for hosting the party and SoStronk which served meals, without their awesome tech the fest wouldn’t have been possible. proves 1ce again ? 1st of all its a show match nothing was at stake and in past few months 2 big lan events happend where they lost both the times to team scrochers on lan so just tell me how can they prove 1ce again they are the best when they lost both the times when it mattered.